Discover a World of Rich Flavour with organically sourced ingredients. 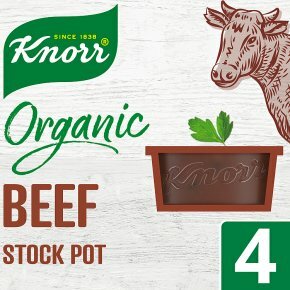 Enjoy our new Knorr Organic Beef Stock Pot, certified by Soil Association. Knorr Organic Beef Stock Pot is made with succulent Beef that adds rich flavour to your dishes. Simply add to dishes such as Bolognese sauce and beef casseroles or use as a rich & flavoursome base for stews. Gluten Free? Yes, of course. Free from artificial colours and preservatives: Absolutely.Knorr Organic Beef Stock Pot will help you bring rich flavour into your dishes without a fuss. Our Knorr Organic Beef Stock Pot is made with quality organic ingredients. They?re slowly simmered with carrot and parsley create an authentic flavour, which makes it perfect for a number of dishes ranging from Bolognese sauce to casseroles, to name a few! Our Knorr Organic Beef Stock Pot is also free from artificial preservatives and colours, gluten free and has no added MSG, which makes them an excellent choice for creating an organic family-favourite meal! Knorr is committed to using the very best ingredients in its products that are not only delicious, but sustainable. At Knorr, we believe that if you cook with a great stock that is made with carefully selected ingredients, which is slowly simmered to release rich flavour it will taste so good, you may need a bigger table to satisfy all your friends and family! We also believe that good food matters and everyday meals can be just as magical and full of flavour as special occasion meals. You can find a great selection of organic food recipes from Knorr and discover our other quality Organic Stock Pot variants such as Chicken and Vegetable at www.knorr.com/uk, don't hesitate to take a look! How to use Knorr Stock Pots: - Adding directly to your dish. - Alternatively, dissolving into 500ml of boiling water. - For a lighter stock, use 750ml of water.